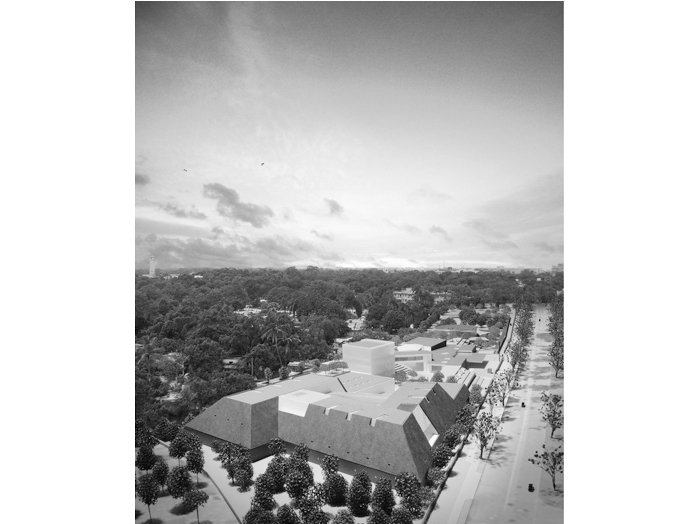 The Bihar Museum is the winning entry of an international architecture competition in 2011. Located in Patna, the capital city of the east Indian state of Bihar, the history museum is intended to display the rich artifacts of the region. Situated on an extensive site of 5.6ha, the low-slung building contains a complex program while preserving prominent trees through an organization based on a campus with dispersed buildings. The exhibition space, children’s museum, entry foyer, and administrative center each have a distinct form, connected in between via arcades and courtyards. The sequence of the exhibition spaces provides a chronological narrative of India’s history through an alternating experience of diverse interior and exterior spaces. Given the rich tradition of metal making in India, Corten Steel is featured prominently on the facades, complemented with terracotta and other local materials of Bihar; the building symbolically links the past and the future through its materiality.